On April 4th 2019, Against the Grain Theatre’s production of Claude Vivier’s Kopernikus will mark the latest occasion of the incredibly long arc in the production history of one of Canada’s most prolific operas. In the forty years between it’s premiere at the University of Montreal and it’s upcoming AtG premiere in Toronto, Kopernikus has toured the globe from Argentina to Paris and London to Amsterdam; and found its most recent Canadian stage at Banff Centre for Arts and Creativity in the Margaret Greenham Theatre. That Banff production was a workshop by AtG’s Artistic Director, Joel Ivany, and was praised in 2017 by the Calgary Herald as ‘the ideal opera of the future’. Stephan Bonfield, in that same article for the Calgary Herald, projected Kopernikus to be an opera ‘both for our times and perhaps, even possibly, for five hundred years from now’, indeed the simplicity and ambiguous spirituality at the core of this opera makes it an ideal candidate for posterity. Yet, in order for a work to remain available for the inspiration of future Canadian composers, it relies as much on it’s own merit as on the active endorsement of the arts communities and councils of each successive generation. Kopernikus is entering into its second generation of audiences, and it’s time for it (and its composer) to achieve the same renown in English Canada as it has enjoyed in Quebec and elsewhere outside of Canada. “His music really resembles no other, and he puts himself right on the fringe of all trends. His music, of a direct and disruptive expression, could bewilder only those hard-hearted people who are unfit to categorize this independent man of genius. Claude Vivier found what so many others have sought for, and still seek: the secret of a truly new simplicity” — Musicologist Harry Halbreich, Harmonie-Panorama Musique, April 1983. Back here in Toronto, rehearsals for the April 4th premiere are underway, with AtG’s Music Director, Topher Mokrzewski, reprising his role as conductor. Matjash Mrozewski who, in the Banff production “created a gestural language to unite the singers, musicians, and dancers” (Ludwig van Toronto), will once again take on the choreography for the ensemble. That ensemble is a cast of two mezzo-sopranos and two sopranos; a bass, baritone and bass-baritone; as well as two dancers who in the last production imparted “an air of ecstatic rapture to the piece” (Opera Going Toronto). Danielle MacMillan will also be returning to her role as Agni—“a fire spirit of ideal protean innocence” (The Calgary Herald)—the centerpiece around which orbits the rest of the cosmic ensemble. The role of Agni was created by Jocelyne Fleury-Coutu, one-third of the creative triumvirate that helped bring Claude Vivier’s vision to life at the University of Montreal almost. The other two were: Marthe Forget, who staged the premier (and died 12 years ago); and Lorraine Vaillancourt as conductor and musical director. In the subsequent years after Vivier’s death in 1983, Vaillancourt was instrumental in the various productions of Kopernikus, beginning in Montreal and thereon to Paris. Her interview for AtG’s upcoming production was a revelation of Vivier’s character and a recollection of the unique character of his only opera: “…there’s not really a narrative, it is a ritual in an invented language, wherein the main characters, apart from Agni, are the passage, and eventually become the music (yes, the music!)”. Against the Grain Theatre’s Kopernikus premieres at Theatre Passe Muraille Mainstage on April 4th, and runs till April 13th. Had you been even the most occasional patron to Montreal’s experimental compositional music scene in the 80’s, then no such introduction is needed. You might have heard his name in association with production houses like Les Événements du neuf (an avant-garde concert society) and titans of modern composers like Karlheinz Stockhausen (with whom Vivier studied composition). On this side of the Québec border, however, his name might ring a bell to those who keep watchful a eye on foreign theatres interested in producing Canadian content. Perhaps the telling fact of the belated recognition of Vivier’s talents within Canada is that news of his death did not make it to any significant English music journal until 1986—his body had been discovered by Parisian police officers on March 12th 1983. Against the Grain Theatre’s production of his internationally prolific opera Kopernikus begins on April 4th and concludes on the 13th, a day before what would have been Vivier’s 71st birthday. He was born in Montreal to unknown parents and was adopted at the age of three by a poor French-Canadian family that tried (unsuccessfully) to return him. Adolescent freedom came in the form of enrolment into a noviciate in preparation for priesthood. He never attempted to hide his homosexuality, a fact not entirely separate from that of his ejection from the Brotherhood at the age of 18 on grounds of his ‘immaturity’. Having benefited from a prolonged exposure to sacred music and now free of the stringencies of religious training, he left for Europe in 1971 to pursue the expression his natural talent: music. All throughout the myriad and eccentric colours through which that talent was expressed, two main elements were ever-present: a secular and yet sacred spirituality, and his fixation upon the loneliness of his childhood (he described his Lonely Child, for soprano and orchestra, as a ‘long song of solitude’). A struggle between the individual and the infinite—the little boy from Montreal struggling for his place in the world, despite a childhood of sexual abuse and neglect; an openly gay man embracing the manifold colours of Parisian liberal life—that is one of the many brilliant contradictions available in the biography of a man whose life is accurately described as hard and fast. Karen Cargill is a Scottish operatic mezzo-soprano who has performed with the Metropolitan Opera and at the Edinburgh International Festival among other organizations. We’re fortunate to have Karen on our faculty for Summer Modern Intensive 2019! Karen sings some of the larger rep in the world of opera (Wagner, Wagner, Wagner). We had some baby-Wagner singers last summer at our Intensive and so we wanted to have some teachers with us who could inspire them. Karen is one of those teachers (Heidi is the other). We asked Karen about some questions about singing big rep and small rep and why she likes working with singers. Q: When you were well on the opera train, how did you know when you were ready to move from safer rep to some of the heavier stuff. How did you get into Wagner and know that it was both safe and what fit. A: I’ve had an interesting journey with singing once I graduated from the National Opera Studio in London. I started singing the usual beginner roles Third lady in Magic Flute, Suzuki in Butterfly, Sesto, when the music director at Scottish Opera offered me the chance to sing Rosina in Barbiere di Siviglia. I was convinced I couldn’t do it and it ended up being the most amazing time of exploration. At the same time I was offered the cover of Waltraute in Götterdämmerung for the BBC proms which I then ended up performing. That meant doing both roles at the same time which was a gift, the Rossini became very lyrical and the Wagner stayed fresh and not over-sung. That’s the thing about Wagner: if you study the score carefully, the vocal parts are so well written that the accompaniment should never push the voice too much. We need to be brave enough as singers to never push. I spent a long time with Waltraute and the Wesendonck lieder making sure that I got to grips with Wagner’s musical language before moving on to other roles and I took my time with each role I’ve tackled since; the Norns, Brangäne, parts of Kundry, Fricka for the first time only recently, Erda for the first time this season. Make sure you have trusted ears with you when you start and ALWAYS begin with the text!! Q: What is it about a singer working with a singer that works so well? A: There’s nothing better than working with someone who knows the inner workings of your job, whatever field you might be in, whether you are a plumber or a teacher or a musician. To be able to share thoughts and ideas with someone who fully understands the trials and tribulations that we go through as a performer is an invaluable lesson. One of the things I love about working with other singers is the sharing of ideas, the fresh perspective that we can all gain whether you’ve been working for 5 months or 15 years. Being able to share some of the knowledge I’ve gained about the business is something I take very seriously. Q: What would you say to your younger self now? A: I had an epiphany about 12 years ago watching a well known singer give a recital. They didn’t ‘try’ to be anyone, anything, they were just present. Along with that came a stage presence that many singing teachers would criticize, blowing their nose, having the words in the piano, not always facing the audience, the thing was that it was completely real. I changed my perspective right there and promised to no longer ‘try’ to give a performance but just be me. In short my advice would be to be authentic, shut out the noise of chasing perfection, it doesn’t exist and that’s actually the place where great art lies. Whoa…. that is PROFOUND!!! Scottish mezzo-soprano Karen Cargill studied at the Royal Conservatoire of Scotland and was the winner of the 2002 Kathleen Ferrier Award. On the opera stage she will appear as Waltraute in Götterdammerung at the Royal Opera Covent Garden and has three return invitations to the Metropolitan Opera, with roles including Erda and Mère Marie. You can still apply for AtG and U of T Opera’s Summer Modern Intensive. Click HERE to apply. The application is free. There is no audition for this program. Click HERE to apply. The application is free. There is no audition to this program. TORONTO, Canada – November 7, 2018 – Against The Grain Theatre, Toronto’s visionary chamber opera company, is known for electric performances that act as “a bracing wake-up call to the spirit” (The Globe and Mail). That daring candor is now being channeled via its new in-house recording label, which launches with a live recording of Osvaldo Golijov’s “ecstatically beautiful…radical and disorienting” song cycle Ayre this December (The New Yorker). Informed by the composer’s personal history as a Romanian Jew born in Argentina, Ayre blends traditional and electronic instruments with elements of Byzantine chant, Sephardic lullabies, Sardinian protest songs, and Arabic, Hebrew, and Christian texts. Praised by Gramophone as “an intoxicating, endlessly haunting mixture of styles and musical cultures,” the technically exacting song cycle has become a signature piece for AtG Founding Member Miriam Khalil. 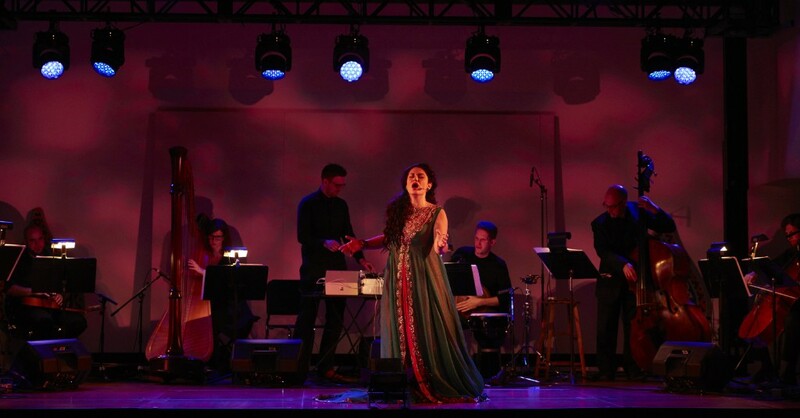 In this video, Lebanese-Canadian soprano Miriam Khalil and director Joel Ivany explore the cultural threads of Osvaldo Golijov’s beguiling song cycle Ayre. One of Canada’s acclaimed singers, Lebanese-Canadian soprano Miriam Khalil is lauded as a “skilled, versatile artist” whose “signature warm lyrical voice” makes “her fine soprano express every emotion with exactness and feeling.” An alumna of the Canadian Opera Company Ensemble Studio, she won first place in the Metropolitan Opera National Council Auditions (Great Lakes Region) and subsequently appeared in the 2007 documentary The Audition. Her performance credits include Glyndebourne Festival Opera, Canadian Opera Company, Minnesota Opera, Opera Tampa, Fargo-Moorhead Opera, Opera Hamilton, Against the Grain Theatre (AtG), Edmonton Opera, Pacific Opera Victoria, Opera Lyra Ottawa, and prominent orchestras across Canada, in roles such as Mimì (La bohème), Mélisande (Pelléas et Mélisande), Governess (The Turn of the Screw), Susanna (Le nozze di Figaro), Donna Elvira (Don Giovanni), Cleopatra (Giulio Cesare), Almirena (Rinaldo), and the title role in Alcina. Ms. Khalil’s 2018/19 season includes appearances as Mimì in La bohème with the Canadian Opera Company, Marzelline in Fidelio at Pacific Opera Victoria, Eurydice in Orphée at the Banff Centre for the Arts, and Noor Haddad in AtG’s Handel mash-up BOUND. Osvaldo Golijov is a composer who blends classical forms with the rhythms and melodies of other genres to create a concert experience that resonates deeply with contemporary audiences. Drawing on diverse musical and literary traditions (from tango and klezmer to the poems of Emily Dickinson and Pablo Neruda), Golijov’s compositions exhibit a fresh, powerful style. Among Osvaldo Golijov’s best known works are the St Mark Passion; the opera Ainadamar; a cello concerto, Azul, and the song cycle Ayre. He has also written soundtracks for films by Francis Ford Coppola (Tetro, Youth Without Youth), and arranged music from many places in the world, primarily for the Kronos Quartet. He is currently working on Falling Out of Time, a song cycle for the Silk Road Ensemble, based on a book by David Grossman. He was born in Argentina in 1960, lived in Jerusalem in his youth, and moved to Massachusetts in 1991, where he is the Loyola Professor of Music at the College of the Holy Cross.